March 1 is Nuclear Victims Remembrance Day in the Marshall Islands, which is a national holiday there. This day commemorates the victims and survivors of nuclear testing done in the area in the 1950s. The Marshall Islands were the ground for the U.S. nuclear testing for over a decade. From 1946 to 1958 the USA tested 67 nuclear weapons there. It was considered, that the Marshall Islands were one of the most contaminated places in the world, that is why the islanders suffered the testing. Today the claims between the USA and the Islands are ongoing, and one of them concerns the health effects, that the islanders have due to those tests. 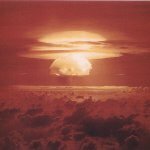 The most destructive nuclear testing was held on March 1, 1954 under a code name Castle Bravo. A fallout of the bomb fell on the residents of Utirik and Rongelap atolls and spread around the world. The islanders were evacuated only three days later after the testing, that is why many of them suffered radiation sickness. Another hydrogen bomb testing led to total destruction of the island of Elugelab in the Enewetak atoll. This testing was made under the code name Ivy Mike on November 1, 1952.